The Spa at Four Seasons, London | StyleAble Fashion For Everyone! When the lift stopped at the 10th floor we were welcomed by a member of the spa team who took us on a tour of the facilities. Designer and architect, Eric Parry had done a fantastic job creating both a luxurious and tasteful environment at the Four Seasons Spa. The view of Hyde Park and the London skyline was also amazing. In the changing room, we swapped our wet outdoor clothes for the robes and flipflops we found in our lockers, before going to a restful blue and white room, with floor to ceiling patio doors, leading on to a small balcony. When the weather is fine lunch (or breakfast) is served on the balcony but, as it was a wet afternoon in February, we were glad to be wrapped in our luxurious white towelling robes, enjoying the view from inside. We chose Bento boxes from the extensive menu of healthy meals. The boxes contained sashimi, noodles and raw vegetable salad. I had fresh pomegranate juice and my friend had a low calorie blueberry milkshake. Coffee and delicious homemade cookies followed, which we drank whilst browsing the daily newspapers and flicking through a pile of glossy magazines. After lunch we relocated to the steam room and sauna, cooling off in between with a refreshing ‘rain shower’. A control panel enables you to select water pressure, temperature and choose from a range of water flow patterns and coloured lights. Although fully sighted, I struggled to navigate around the panel, so anyone who is vision impaired may find it a challenge. I was surprised that the Spa didn’t have a swimming pool, however, the vitality pool was large enough to comfortably accommodate an entire rugby team and, since we were only two, we had plenty of room to splash around. The seating in the pool was quite hard to find under the swirling water, which again could present a hazard for those with sight problems. 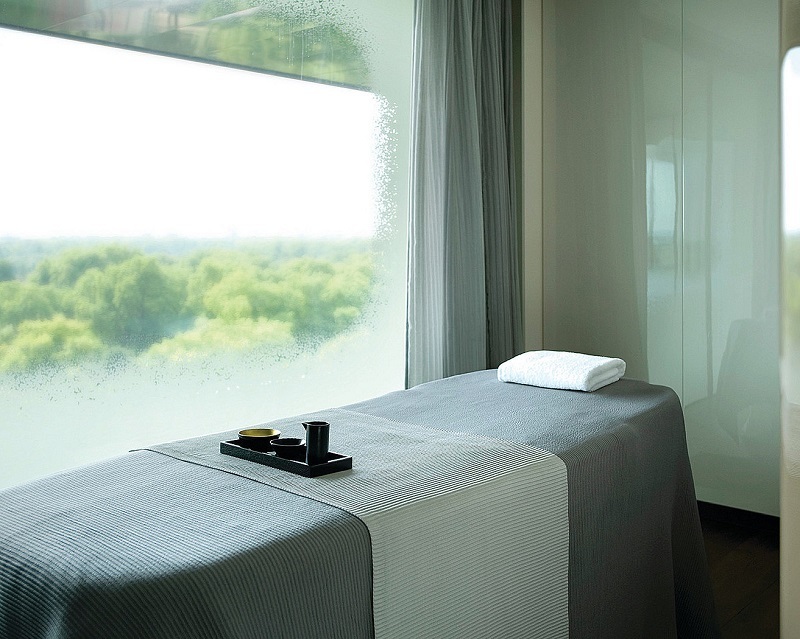 We were both booked in for the ‘Hyde Park Awakening’ – a package that includes an aromatic foot soak followed by an exfoliating body treatment and a stress busting back, neck, shoulder and scalp massage. All the delicious products used came from the Organic Pharmacy range. Not surprisingly the majority of therapy rooms at the Spa are private, although there is one that accommodates two people (we had a room each). The first thing you will notice when entering is the view across London. Since the sun was setting, I had the curtains open and was able to enjoy the scenery. Carol, my professional and friendly therapist, began the treatment with a feet washing ritual – I then got comfy on the heated massage table, ready for the exfoliating body scrub to begin. The Bamboo and Calendula body scrub was divine! After showering off the scrub, Carol asked whether I had any particular areas that needed work – I mentioned that the backs of my calves were tight from jogging, so she included a leg massage in the session. Although I’d asked for a ‘firm’ massage, it was still relaxing, rather than the normal painful sports massages I’m used to. Feet were included and I had some tenderness in a particular spot – which Carol told me related to the digestive system. The session ended with a neck and head massage – much more relaxing than the ‘good old scratch’ that I recently received in India. The 80 minutes went by far too quickly, I felt light headed and totally relaxed and was pleased to be shown into a ‘Pod’, complete with a mechanical bed enabling me to raise the angle of my head and shoulders at the push of a button, and was served with herbal tea and assorted nuts. Then, sadly, it was time to leave the tranquillity of the Spa and head back to Victoria train station on the bus. The five and a half hours spent there had flown by. The Spa facilities are available free of charge to all guests staying at the Hotel. Non residents can make full use of the Spa when having an 80 minute treatment. Treatments available include manicures, pedicures, Reiki, body wraps, massages and facials. There are also a range of packages to choose from including the Hyde Park Awakening treatment which takes 80 minutes and costs £175.